AG Jeans - The Prima ankle - Cigarette Ankle Size 27R. Condition is Pre-owned. Slightly used Jeans. In very good condition. Selling as is, no returns. Shipped with USPS Priority Mail. 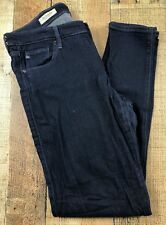 Size 29 R. The jegging super skinny fit corduroy pants / jeans. Five pockets. Cotton, PU. 🦋 15” waist straight across 🦋 8” rise 🦋 30” inseam 🦋Condition: Pre-owned, excellent condition 🌻PA361/K0177. Adriano Goldschmied jeans. Color -grey. Inseam -27. Soft, gently worn, stretchy skinny jean. Classic and cute. Flat lay photos of waist and inseam are in photos. A mid-rise cigarette jean has a slim yet comfortable fit in white stretch denim. Designed with a zipper fly and button closure. Mid-rise cigarette. Knee Opening: 13.5". Front Rise: 8.5". AG ADRIANO GOLDSCHMIED in digital. An allover weathered-denim print brings worn-in appeal to these super-skinny AG Adriano Goldschmied leggings. Double-sided printing allows for an easy cuffed look. Adriano Goldschmied jeans. Color -blue. Inseam -29. Front Rise:8.25. Back Rise:13.25. Stunning wash. Normal signs of wear. Item Condition . Inventory:B4 ￼ THE simple solution for eBay sellers. These skinny jeans from Adriano Goldschmied denim pants are amazing! They are a pretty medium wash with faux front pockets and two back pockets. They are in great condition! There is some wear on the left knee and the slightest stretching on the front (both pictured). Size 27R. SKD 1532. NWT AG-ED Adriano The Legging Ankle Super Skinny Distressed Jeans SIZE 24. Condition is New with tags. great ankle seam feature! brand new was $228 Shipped with USPS 1st Class Mail. Skinny jeans with abstract slanted hems. Leg circumference, about 10". Five-pocket style. Made in USA of imported fabric. Inseam, about 28". Adriano Goldschmied. Designer/Label - AG Adriano Goldschmied. Intimates and Sleepwear. Style - The Legging Super Skinny. Style - Skinny Jeans. Pattern - Light Wash Denim. Wash - Machine Wash. Occasion - Casual. Here is For Your Consideration. AG Adriano Goldschmied The Jegging super skinny Jeans. Shipped USPS First Class Mail. 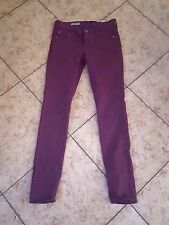 NWTAnthropologie Adriano Goldschmied Low-Rise Skinny Ankle Legging Jeans SZ 30. Skinny, Legging, ankle fit. 28" inseam. 10" leg opening. Machine wash.
Super soft, with a bit of stretch. In excellent preowned condition! See photos for details! AG Adriano Goldschmied Prima Mid Rise Cigarette Jeans Size: 30 x 26 (see photos for measurements) Dark Wash Stretch Excellent condition! No notable flaws. See photos for condition details. Ships FREE with USPS Priority Mail. Adriano Goldschmied. Designer/Label - AG Adriano Goldschmied "The Legging Super Skinny". Intimates and Sleepwear. Style - Skinny Jeans. Pattern - Dark Wash Denim. Wash - Machine Wash. We have a large selection of clothing, shoes, belts and handbags. Ag Adriano Goldschmied 27 Jegging Super Skinny Fit Jeans Black Pull On Zip . Condition is Pre-owned. Shipped with USPS Priority Mail. Excellent Condition! Please feel free to ask any questions or make an offer! All prices are negotiable! Inseam Length approx 27”. Waist flat approx 15”. FEATURES:Zip fly with button closure. 5 pocket construction. Faded and whiskered. Super skinny fit. FABRIC CONTENT:70% cotton, 14% polyester, 14% tencel, 2% elastane - Super soft, stretch denim. IMPERFECTIONS:No noted defects or alterations. Lots of stretch and super soft. leg opening across flat 6". Laying flat waist 15", inseam 29.5", front rise 7.5". Waist - 27". Leg Opening - 11". Item: AG Contour 360 The Legging Ankle Super Skinny Ankle (Jeggings). Inseam: 28". Material: 85% Cotton, 11% Polyester, 4% Polyurethane. Waist: 14". Condition: Excellent preowned condition. No holes or stains. Cute AG Denim Capris. The Shorty. Rolled Cuff Bottoms. Great Condition. THE CORDUROY PRIMA cigarette leg. This mid-rise cigarette pant has a soft, luxe texture in fine-wale corduroy with subtle stretch woven in for a sleek shape and exceptional comfort. Five-pocket design with tonal stitching, zip fly, and button closure. Condition: Good! 15 across waist. These distressed AG Adriano Goldschmied cigarrete leg jeans . Shreds and heavy fading add well-traveled appeal. Single-button closure and zip fly. Super good contion . SM02461424 in.25 in.26 in.27 in.28 in.29 in.30 in.31 in.32 in. 25 in.26 in.27 in.28 in.29 in.